Felissa rose & Sean Whalen May 8 -10 at Franklin Comic Con. Includes a screening of No Solicitors and Karaoke. And acting classes. Location: Hudson Horror Show @ the Alamo Drafthouse Cinema in Yonkers NY. Horror Realm™ is a convention run by fans for fans of zombies and the horror genre. The convention takes place in Pittsburgh. WHEN: Feb. 21st. Doors open at 5PM. FILM STARTS at 6PM! WHERE: SANDS EVENT CENTER, Bethlehem, PA at the Sands Casino! Sunday Feb. 15th at 2:00p.m Dark Delicacies presents a signing for the DVD release of Jurassic City. Dark Delicacies is located at 3512 West Magnolia Blvd, Burbank, Ca 91505 and can be reached at (818)556-6660 or darkdel@darkdel.com. Felissa will be joining the screening for Q&A afterwards. *Felissa Rose and Tiffany Shepis-Tretta will both be signing! Join FELISSA ROSE, to DAYS OF THE DEAD: ATLANTA, happening February 6th - 8th 2015 @ the SHERATON ATLANTA. Felissa will be joining Chicago's Days of the Dead November 21st - 23rd. October 25th meet the stars of BR in person for a special Q and A! ATROX FACTORY - October 17th & 18th. LA Days of the Dead 2014. Felissa will be appearing on September 27th & 28th 2014. Marriot Airport Hotel. Please click below for more info. Join Felissa Rose on May 30th for a special miidnight cinema screening of 'Sleepaway Camp', in celebration of Scream Factory’s brand-new Blu-Ray release - Click Here for details & tickets. CALGARY HORROR CON - 4th Annual Calgary Horror Con 2014. 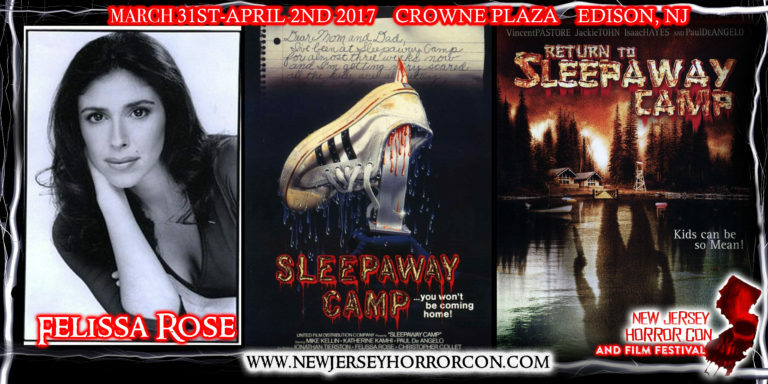 On May 31st at 2 p.m., Felissa Rose, Jonathan Tiersten (and others soon TBA) will be signing Sleepaway Camp (BR/DVD Combo).